Contradictions in daily life are self-evident. While most of the country was worrying away about government shutdowns and polar vortexes, those who could attend made it to a sold out 2 night jam party starring bands Tweed and Lotus to dance and wiggle the cold away. Put on at the renovated Spaghetti Warehouse that is Union Transfer in Philadelphia, both bands gave a solid performance to the city each band was formed in. Night 1 was kicked off by Tweed opening with the song “You,” a great song to kick the night off with, getting people to bob and sway before they had even gotten their first beer. Uplifting vocals tag teaming with funky dance rhythms really brightened both the crowd and the venue up, setting the mood for what patrons should have been expecting for the next two nights–but they didn’t commit to a single sound. Swaying into different tones during their set, they were able to show that Tweed has variety to themselves. Towards the end of what I suspected to be the song “Feargasm,” they closed the song with a beautiful and slow psychedelic interlude that showed they could shift gears. The hued melody was short lived as they came right back into a swift tempo, bringing the crowd right there with them. At some point half way through the set, bassist Dan McDonald was given an opportunity to show us he isn’t falling into the trope of the left behind bassist by giving us a sweet bass solo that the rest of the bands playing was able to compliment him on. They went onto give a strong finish, them walking off the set reminding several people they weren’t the headliners. A quick set break was announced, and everyone who partakes herded themselves outside to the smoking section (which was irritably revoked on the second night). The band must have really been anticipating themselves because once they came back on, the previous felt very much like a warm up. Not long after they started playing (by opening with their song “Wax”) the lights sprang up behind them, turning them into silhouettes for most of the rest of the set. And man did those shadows rip. Diligently they riled up the energy in the room, turning it up a notch every other riff during “Sift,” only to maintain the tension by making what could be said to be a flawless transition in “Flower Sermon.” After lushing up the crowd a bit, they started building again with “Fortune Favors,” also off their new album. They kept climbing until they erupted into “Tip of the Tongue,” that last song before their encore; “Bush Pilot.” At one point someone next to me stopped dancing to say to their friend “Man, I love a good Tip of the Tongue jam,” and I think that sums up the night. Night two still had the same air about it as night one did, Tweed making sure that everyone knew they were the choice pick for opening up for Lotus. Their night 2 set didn’t stretch genres as much as their first did, streamlining straight jamtronica the whole set with the exception of their cover of Gorillaz “Stylo.” But everyone thrives on their bread and butter, metaphorically speaking. Keyboardist Jon Tomczak felt more pronounced, bringing what drummer Joe Vela elegantly described as “the color and special effects of music”. Everyone who had attended yesterday got right into swing of the jams. They had violinist Charles Field aka Chaz, Pet Cheetah, front-man and friend of the band, sit in with them using an electric violin to perform the song “Save Yourself,” which was unexpected for a violin to sit so neatly in a funktronic song. Without skipping a beat, Lotus picked up right where they left off. Opening up with “Middle Road”, it felt more like a set break had passed instead of a whole day, all of night two feeling like a much wanted continuation of night one’s second set. You could see the band was well rehearsed and had their formula down. Just when you thought Mike Remple’s fingers where about to fly off from strumming so fast, him and the rest of the band would bring it up another level. But before they could overdo it by exceling into white noise, the band would dial it back just enough to let the crowd breath it all in. I don’t remember too many times where I’ve seen a jamband and felt the need to formally clap after a song of theirs so much as holler, but it seems me and the rest of the crowd felt the same unspoken sentiment. However none of us would get the chance to display that sentiment for most of the second set as they played nonstop through “Nematode” > “Did Fatt” > “Philly Hit” > “Flower Sermon” blowing us all away and heating the place up so much you’d thought it was July. After everyone picked up their jaws and gave their unanimous applause, the band came back out and finished with an encore of the song “128”. 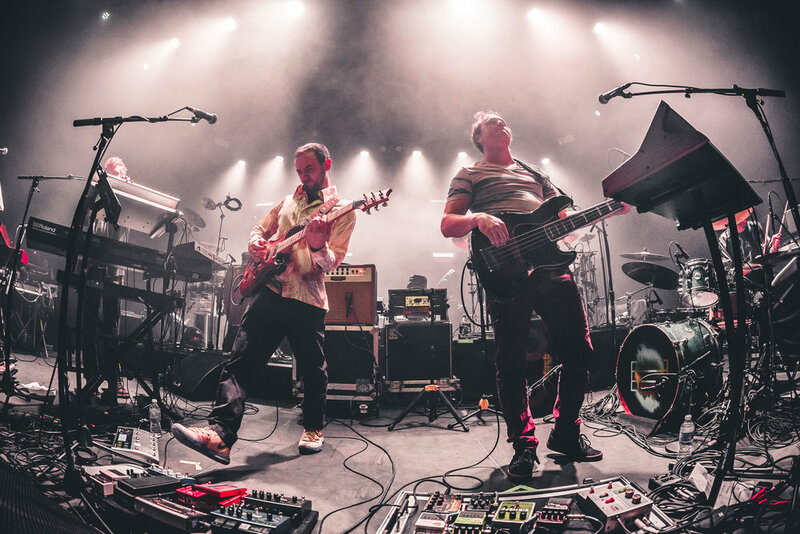 While I personally thought “Flower Sermon” would have been a better closer than “128”, it was still a great way to end what was an extreme solid two night run in what Tweed’s bassist Dan mentioned, is the jamtronica capital of the world. Check out Lotus’ new album Frames Per Second and the new music video for Tweed’s single “El Sucio Grande”, both out now.